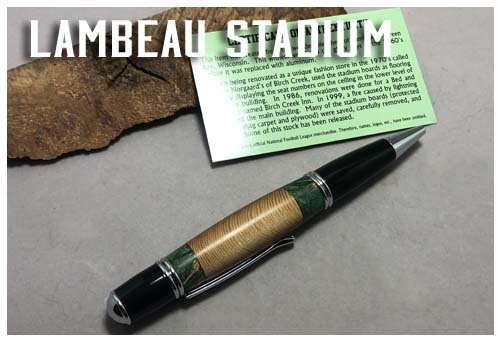 This wood came from the wooden bleachers of Lambeau Stadium in Green Bay, Wisconsin. Perfect gift for the super fan in your life! This "witness wood" saw the glory days of the 1960s before it was replaced with aluminum. 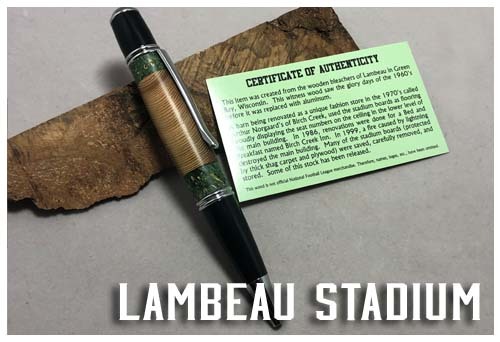 Each pen includes a Certificate of Authenticity detailing the history of the wood and a gift box. Includes a green band of dyed burl for stability. I have a VERY limited supply of this wood. Once it is gone, I doubt I will be able to find more. This pen style is called the "Wall Street" pen and uses a Parker style refill, available below and at any office supply store.